For many of us, the time between Christmas and New Years can be hectic and busy! 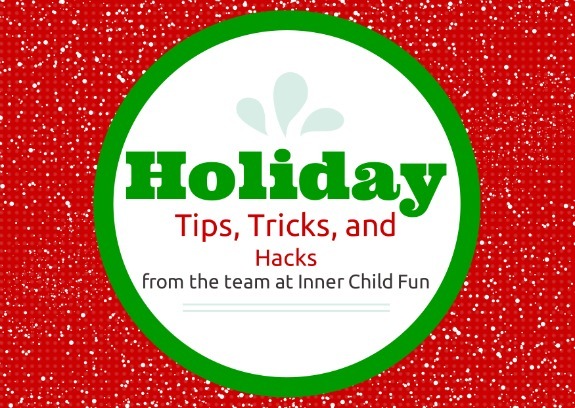 Fortunately, our team of writers here at Inner Child Fun have shared some of their best holiday tips for parents for making the most of this time of the year to savor with family and friends. For a last-minute handmade gift idea for the little ones on your list, Val of Collecting the Moments…One by One shares this great tutorial to make adorable sweater slippers! Jessica of All She Cooks shares fantastic tips for hosting your own gingerbread house decorating party as well as plenty of ideas for volunteering during the holiday season. Becky of Crafty Garden Mama shares these great tips for a natural holiday, and some TV free activities that are sure to get you into the holiday spirit! Jane of Buzzmills offers lots of simple ways to slow down and enjoy the holiday season. Tiffany of Peanut Blossom shares her five best recipes for freezer meals — perfect for the busy holiday! I cannot wait to try the chili and old-fashioned beef stew! Leann of Montessori Tidbits shares some inspiring ideas for kids to participate in service projects this holiday season. …and of course you’ll find plenty of simple Winter crafts to do with the kids here on Inner Child Fun! Getting ready to ring in the New Year with the kids? Check out this idea to keep the kids entertained with countdown goody bags made with items you probably already have on-hand, or that can easily be obtained at your local dollar store. Wishing you and your family a wonderful holiday season and all the best for 2014! !